So my favorite time period is the 20’s and 30’s. I love the clothes, cars, colors, patterns, food, music, and furniture. Because of this love of these eras I collect vintage accessories for my home and gravitate towards jadeite green color, cabbage roses, kitchen equipment with that vibe to it. So it is no wonder when I spotted this dresser and night stand. You can see the night stand here on the left sitting on the table. Missing it’s side and seen better days. It was purchased for the sum of $2 at a yard sale. Kept in my work pile for a long while. 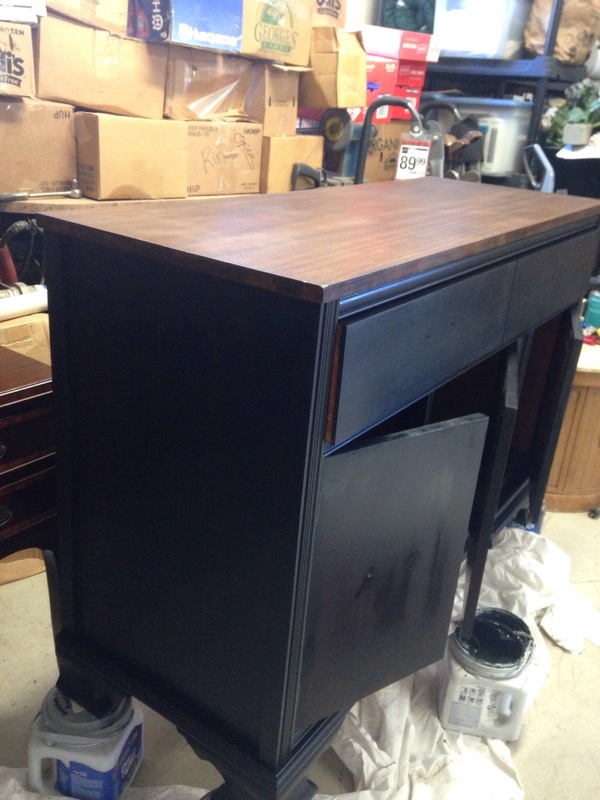 The dresser was in better shape. I picked up in a cute local shop. This is the photo I shot while it was in the shop. I’m terrible about before shots. Finally the plan and work time came together to get these painted. 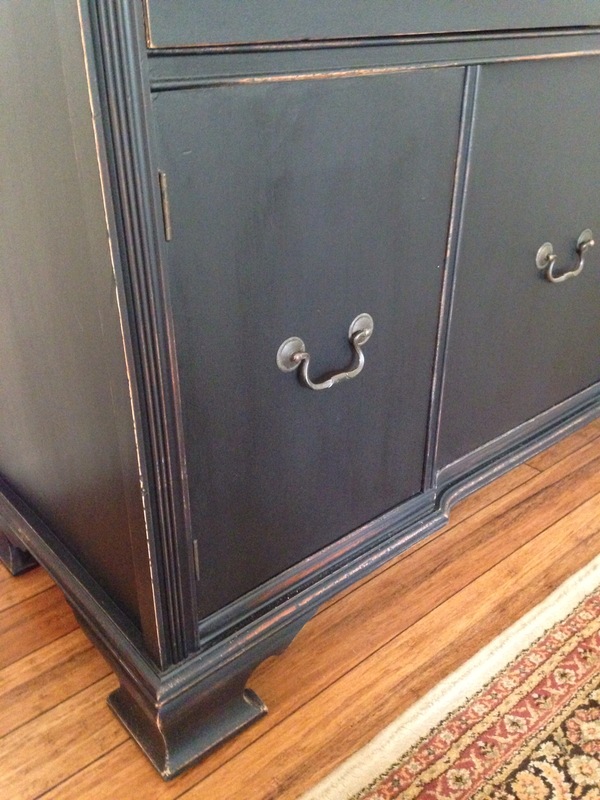 I knew I wanted to use milk paint and hoped I would get a little chippiness in the process. 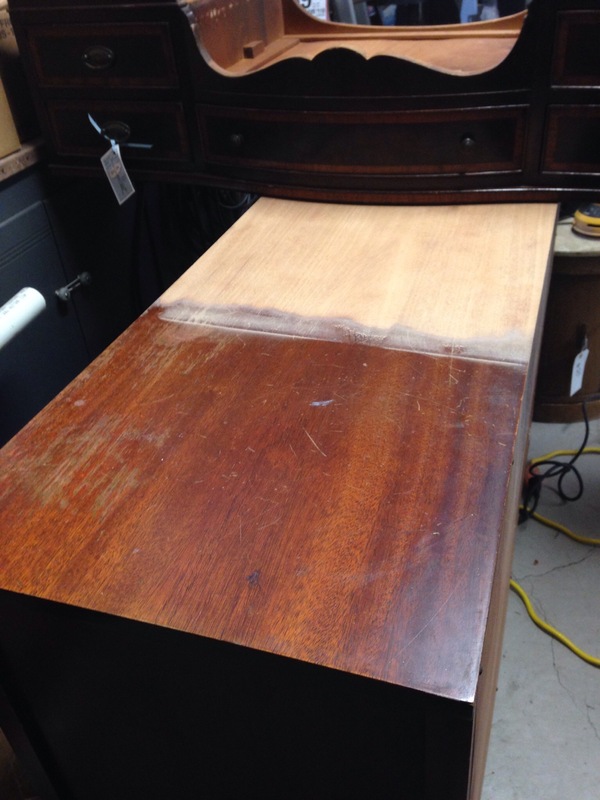 The tops were sanded down on both and they were cleaned and repaired as needed. Then I mixed up my milk paint from Sweet Pickins in creamy. 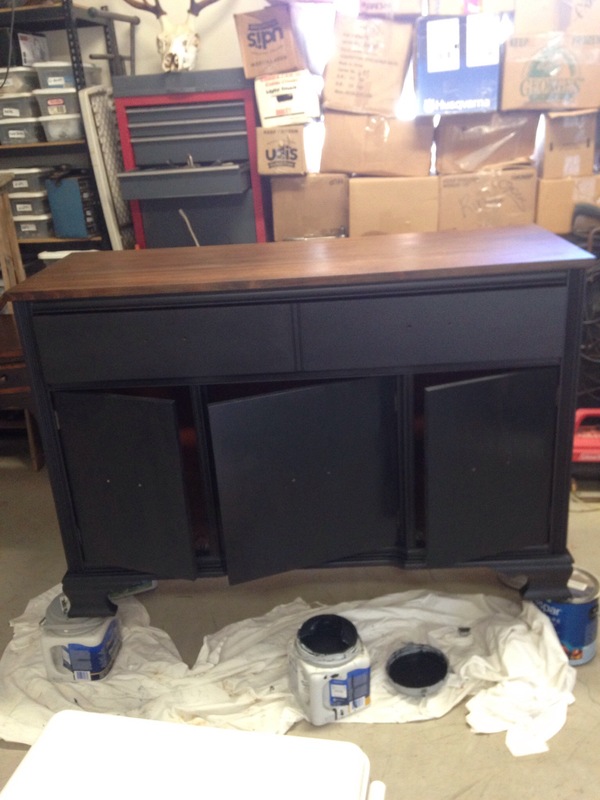 I started with one coat and needed up with three coats total. I started getting some of that chippy going on after the second coat and even more with the third coat. Swoon….so perfect. From here I used Sweet Pickins in “Flour Sack” which is a gorgeous true warm white. Oh look at that chipping and colors. I preserved the original Birdseye stenciled piece for the center as a tribute to it origins. I used some great floral napkins for the application on the drawer sides. 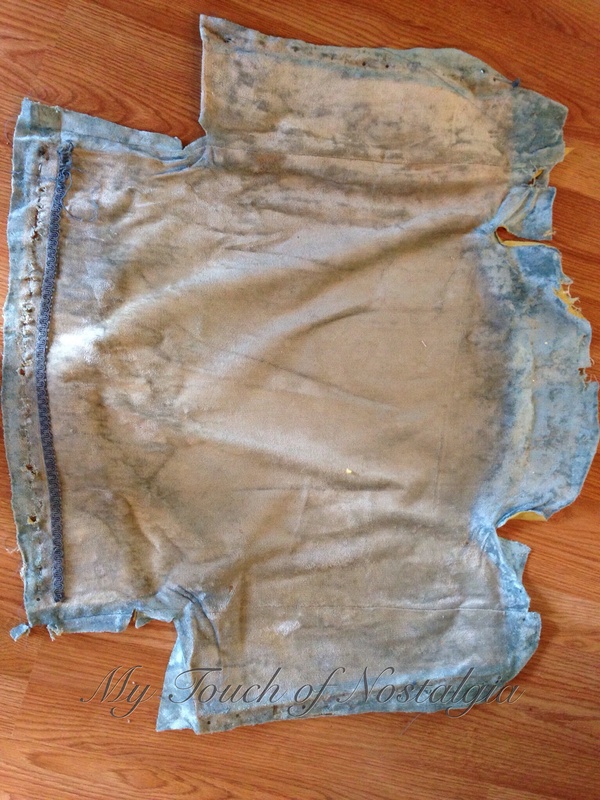 At first I used Mod Podge, but it was think and the napkins didn’t want to move and tore. I then used Top Coat. It’s Sweet Pickins to the rescue again. This product went on smooth and worked perfect. 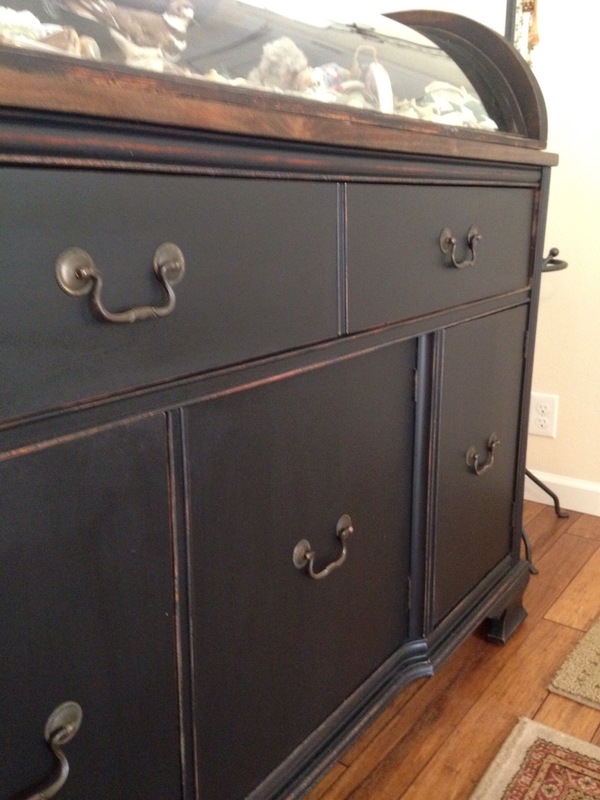 I also used Top Coat for applying in the the drawer front on the night stand. Oh those cute wooden wheels! 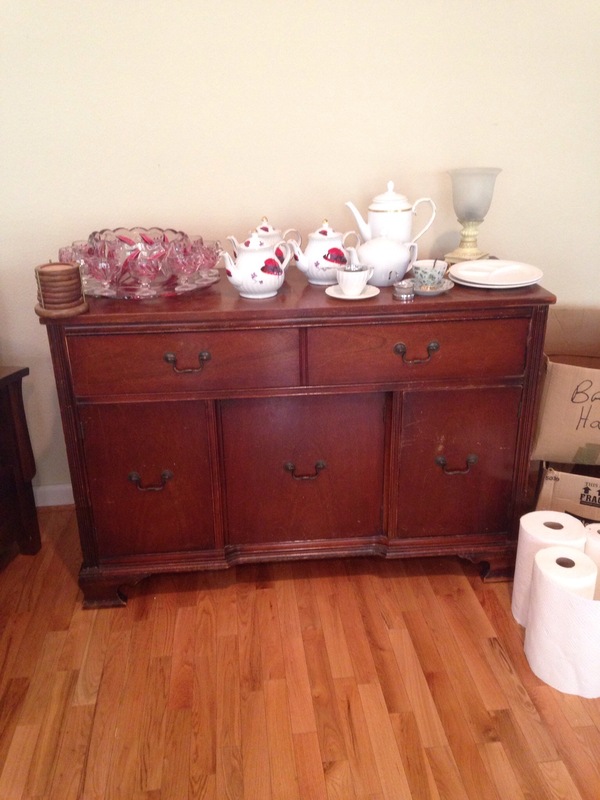 The dresser was missing hers but I happened to have a spare set and worked perfectly. Both piece were waxed with clear Bees wax and the dusted with aging dust. 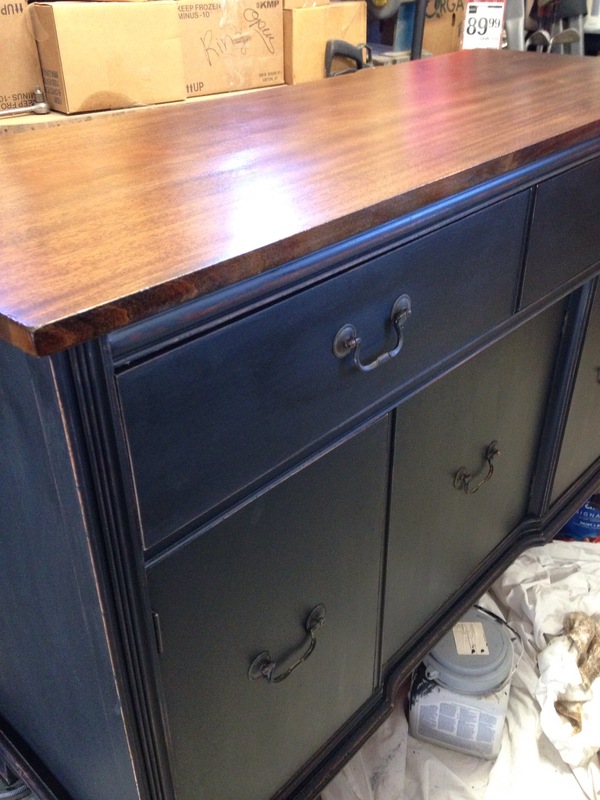 The top was stained with Minwax Jacobean and sealed with 4 coats of polyacrylic. I guess you have figured they are moved in with me instead of being sent along to a new home. Now to find a vanity piece to go along with these. I was not endorsed or compensated for any of these supplies. I purchased, used and liked the products on these pieces and would honestly recommend them to anyone. 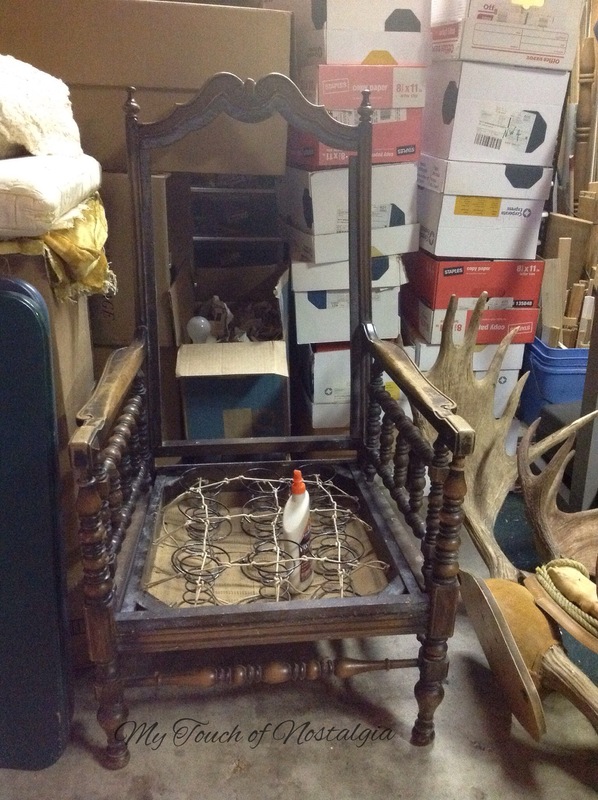 It just dawned on me a few days ago I never shared the story of this chair. Where does the time go? 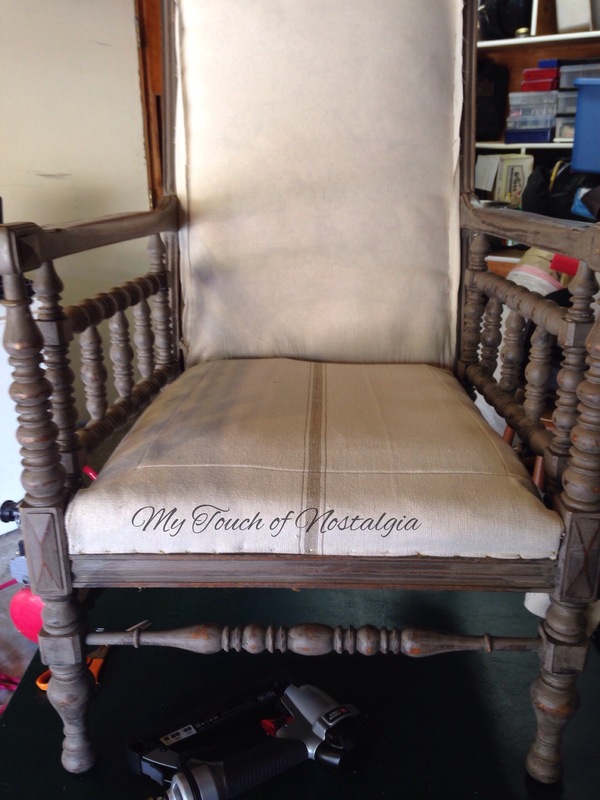 After a full weekend of Pickin with a fellow pickin lovin girlfriend and associate it made me think of the time I found this chair at a local thrift store. It was actually outside behind the store with a sticker that said “stinky chair $5” well that didn’t scare me and neither did the looks of it. 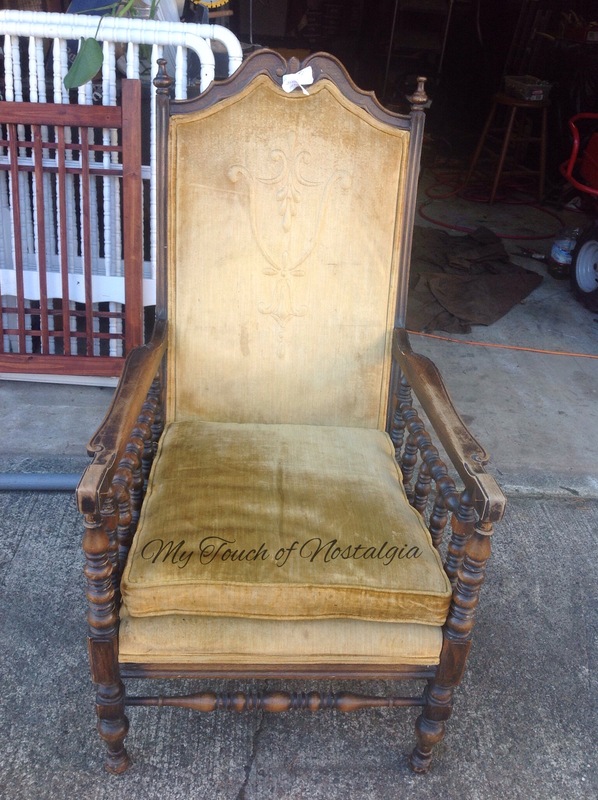 Gold velvet with an embossed crest on the seat back. It was sturdy, and truthfully I have worked with “stinkier” (is that even a word?) chairs than this one in the past! 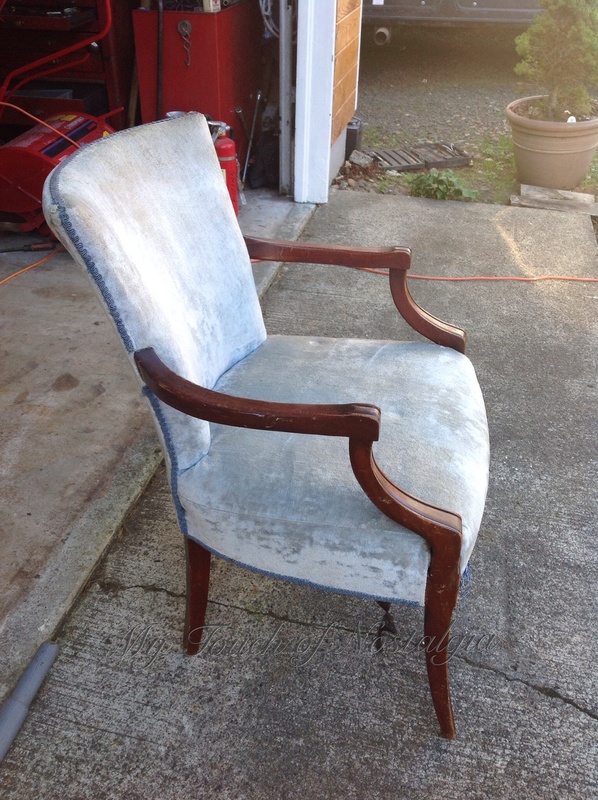 So first I started stripping the upholstery off and removed the cushion for a complete redo. Sorry about the awful photo! Moose antlers and all the junk. Here it was stripped done to her bones and some small repair done and starting to pull her back together. A little hint of fabrics choices. Now she is coming together. 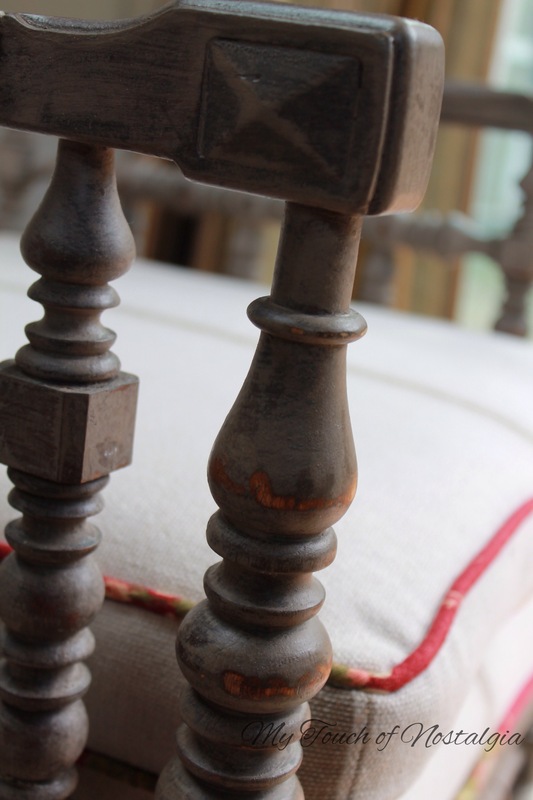 Milk painted with “Suitcase”from Sweet Pickins milk paint line. Then distressed and waxed. We all love painting all those spools by hand.❤️ Yes I know I have strip of chair back web in the seat, I ran short and couldn’t wait to more or the black stripped. 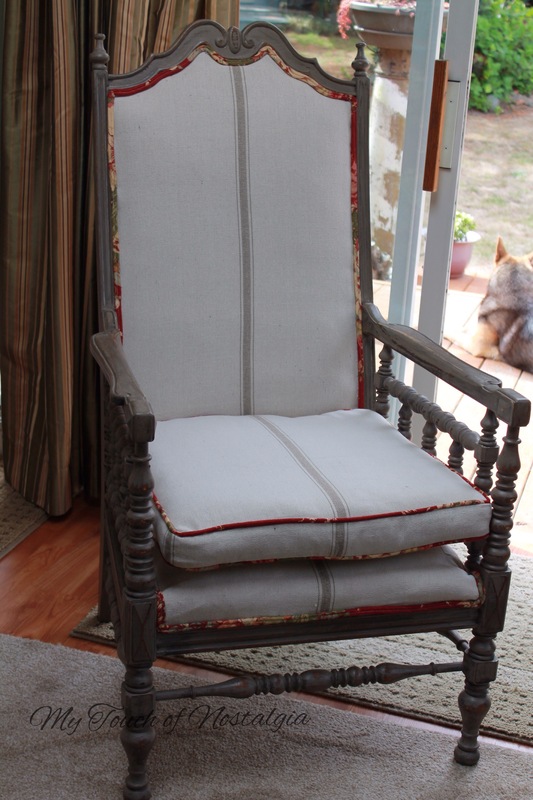 I replaced all the batting, webbing, and burlap with new and started by using new muslin as the base upholstery. From here started on the seat with covering it in the European grain sack with a beige stripe. 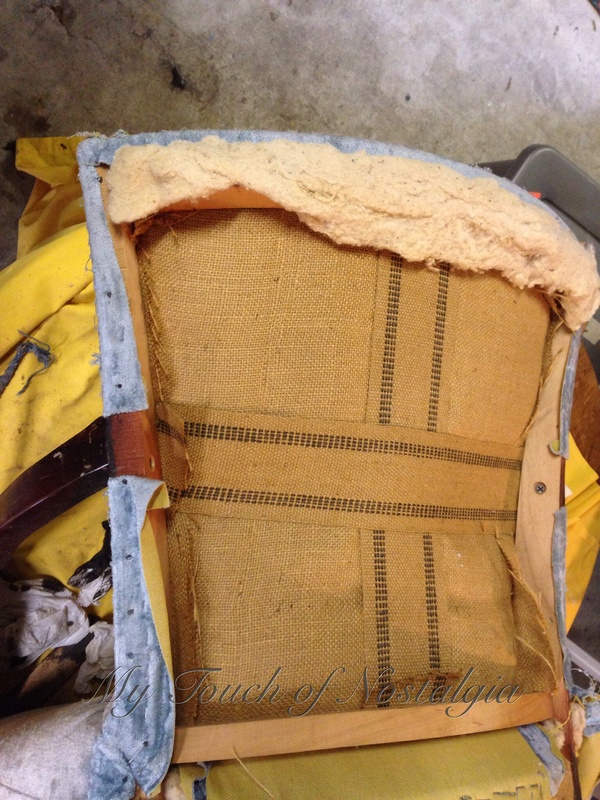 Then the seat back received the same fabric. 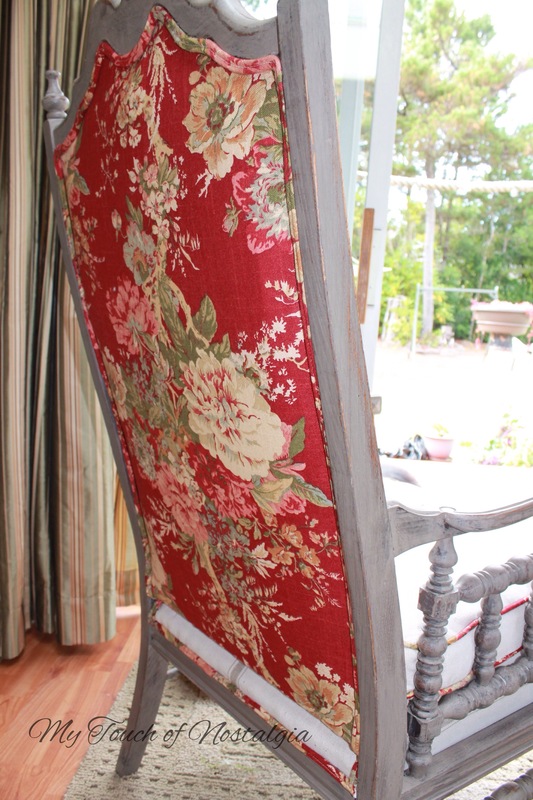 But to change it up I used a deep red Waverly rose print for the back of the chair. 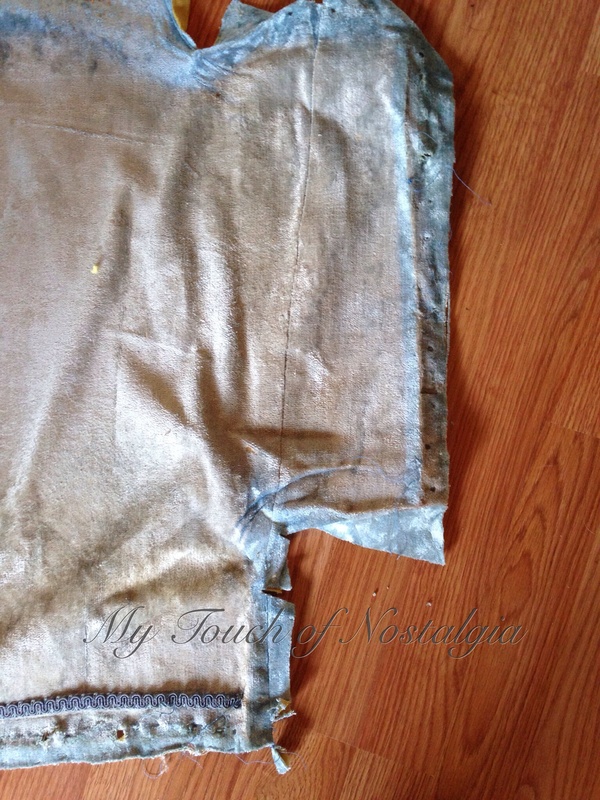 The same fabric I used for the double welt I made to match. 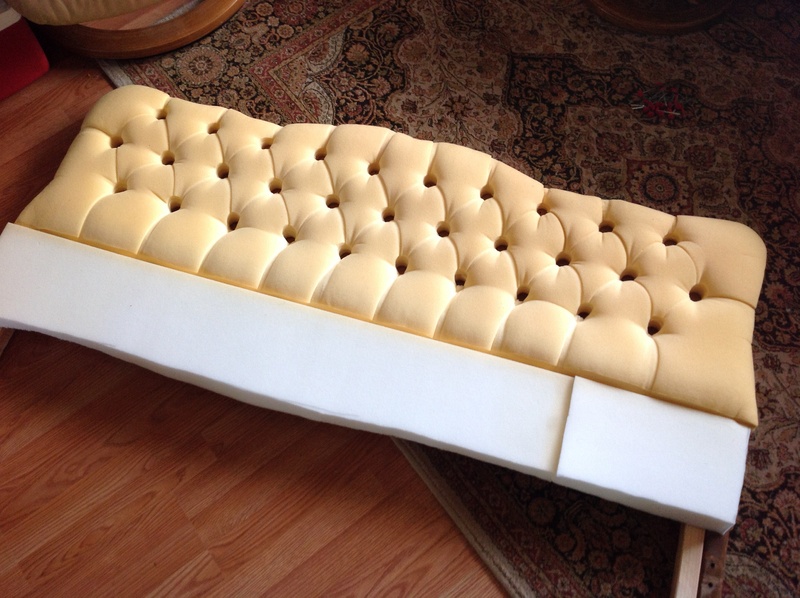 The new foam was cut and the cushion was made. 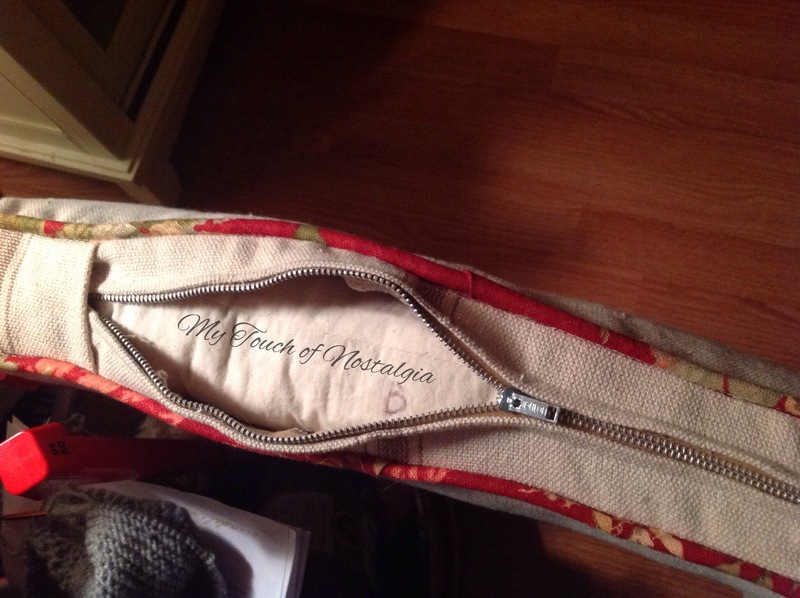 This was enclosed in a cushion cover using the same grain sack fabric with the Waverly Rose for the piping. 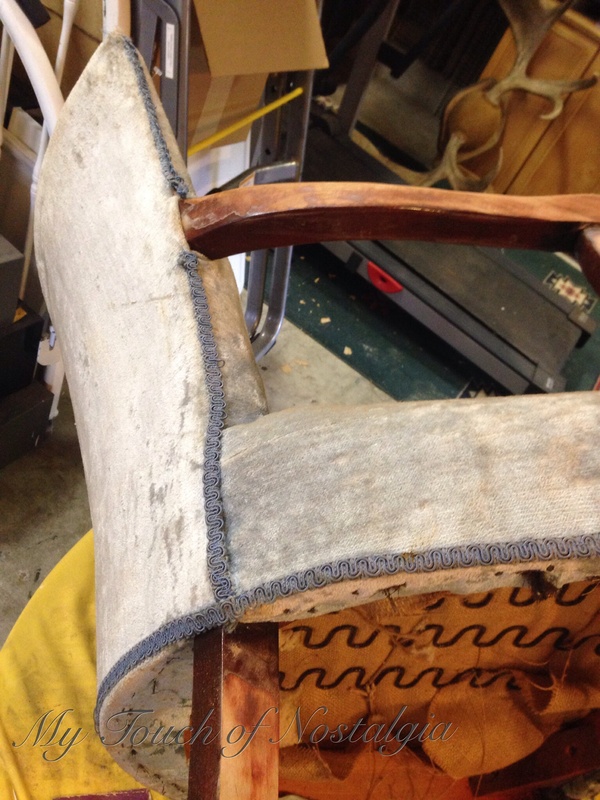 The finished chair is a perfect flip. And so comfortable to sit in too. 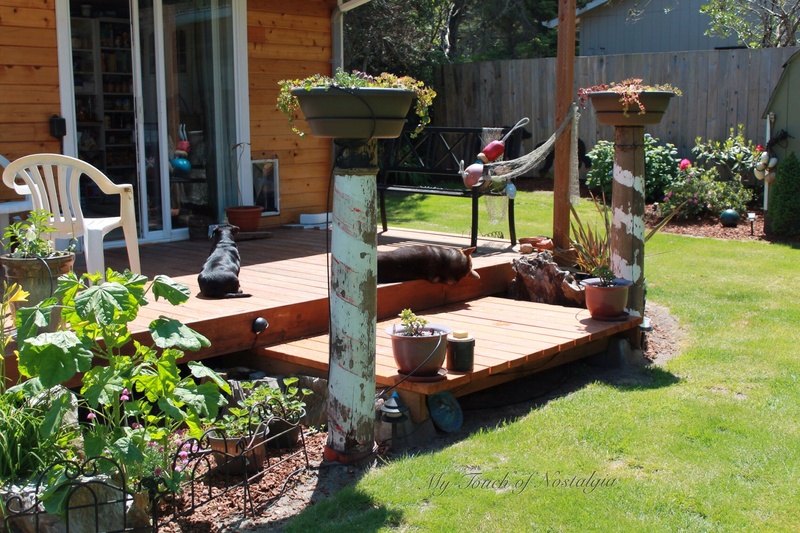 Love the spools and spindles. This display cabinet top part came, but it just never had the perfect base. 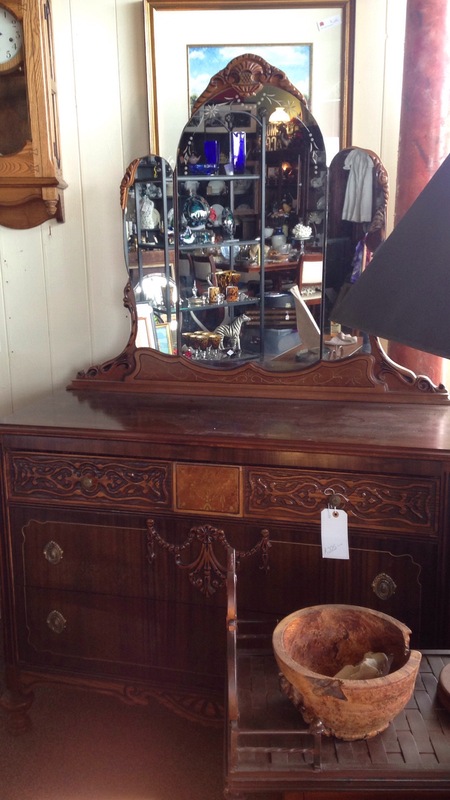 Well finally this spring at an Estate sale I found the piece I thought would work. I have stored in my phone the detentions of what I needed to fit this odd sized curved glass piece. Here is the piece as it was found. It was rough but had good bones. It was stained, dinged, and scratched, however I could see the potential! You can’t see the top in this one but you get the idea of the color and condition. Plus it was just the right dementions! It sat in the garage until a few weeks back when I decided to sand that top down and see what was really lying underneath. I then sanded more and applied some expresso stain. This brought out the grain and gave it nice color not that red mahogany. 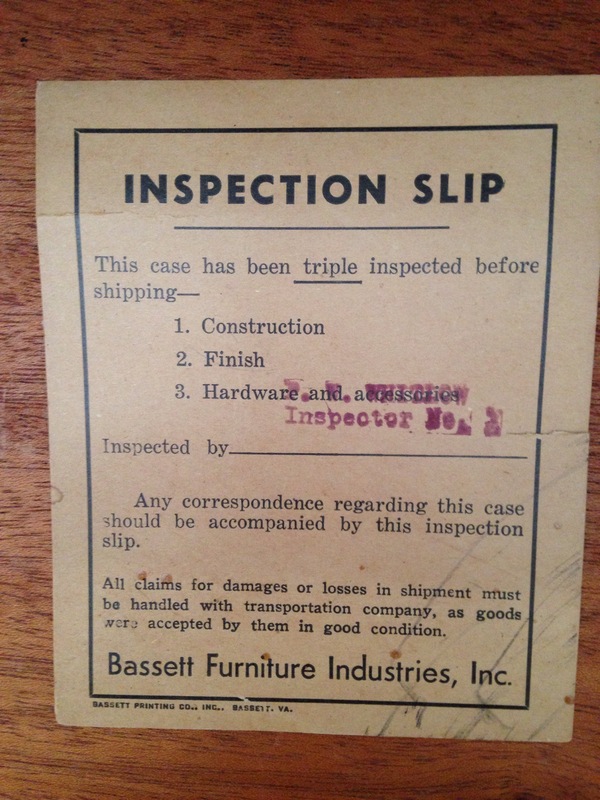 I even discovered it’s label…nice to know it was triple inspected! Then the painting began. 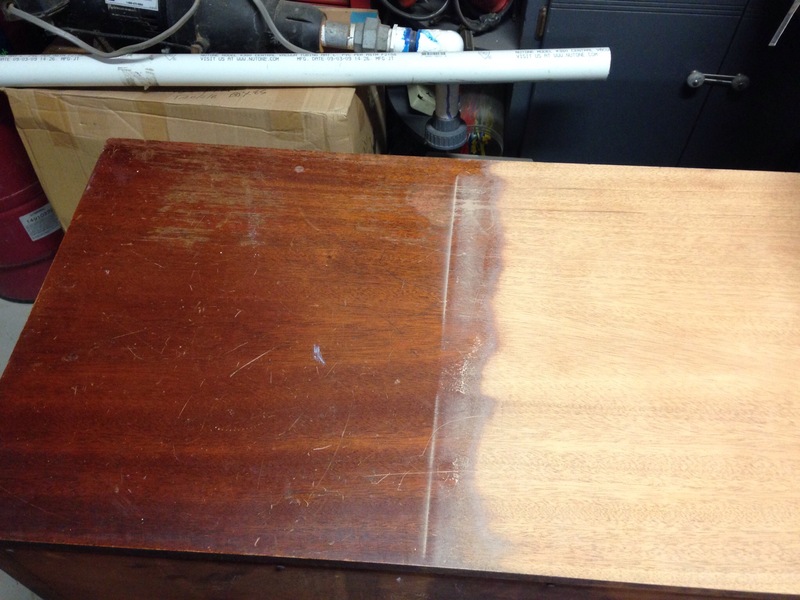 After a couple of coats, some sanding and using PolyAcrylic on the top it is starting to show its new look. 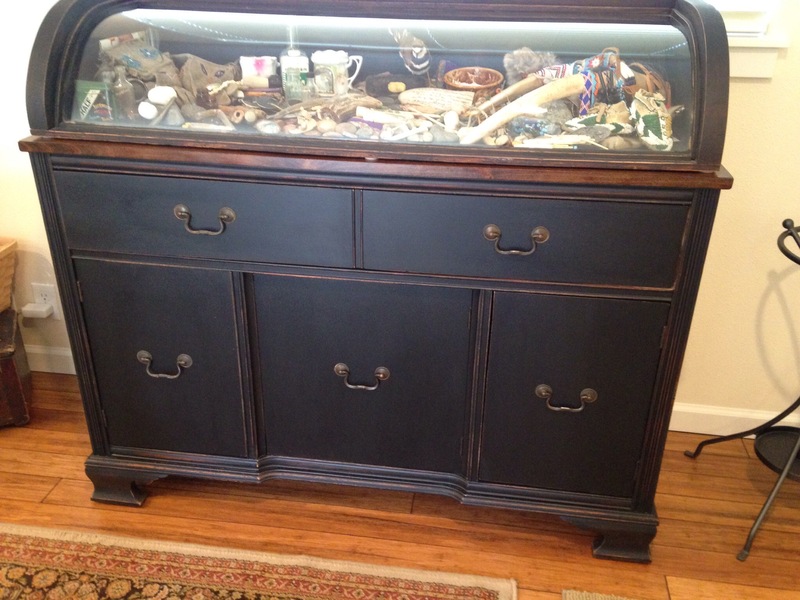 I then did some mild distressing to match what I had done on the display cabinet. Plus 3 coats of sealer on the top. I cleaned and reused the original hardware. They were complete and worked well with the design. After curing and being moved into place, the display cabinet was set in place and is a perfect match. Looks like they were make for each other and a custom piece. Plus look at all that storage under there! The distressing looks white however it is a great color of wood showing through. I know it’s way overdue. But life happens and time has a way of getting away from us. We did sell and moved on December 13. I just wanted to share the last photos of the interior with it all done. This is a photo heavy post, just a warning! 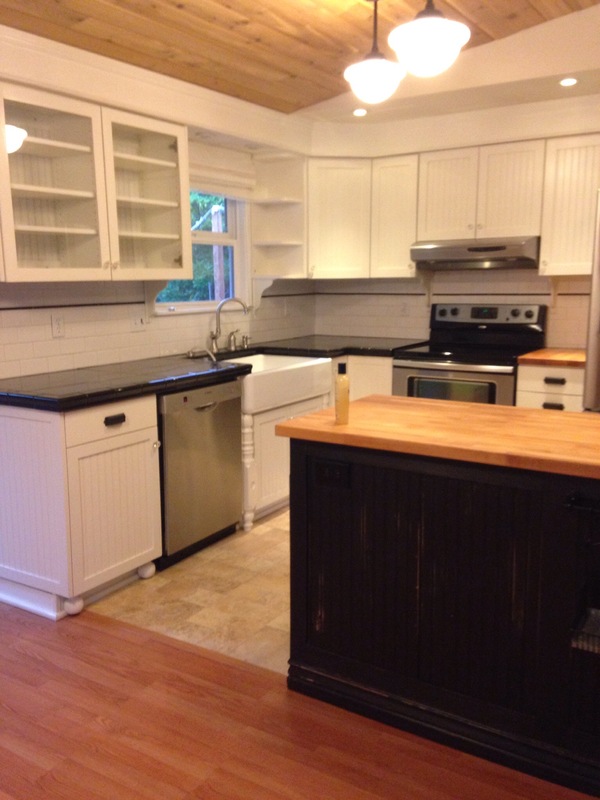 Here is the kitchen all finished and the view of the farmhouse sink. Here is a different angle showing my bun feet and cabinets. 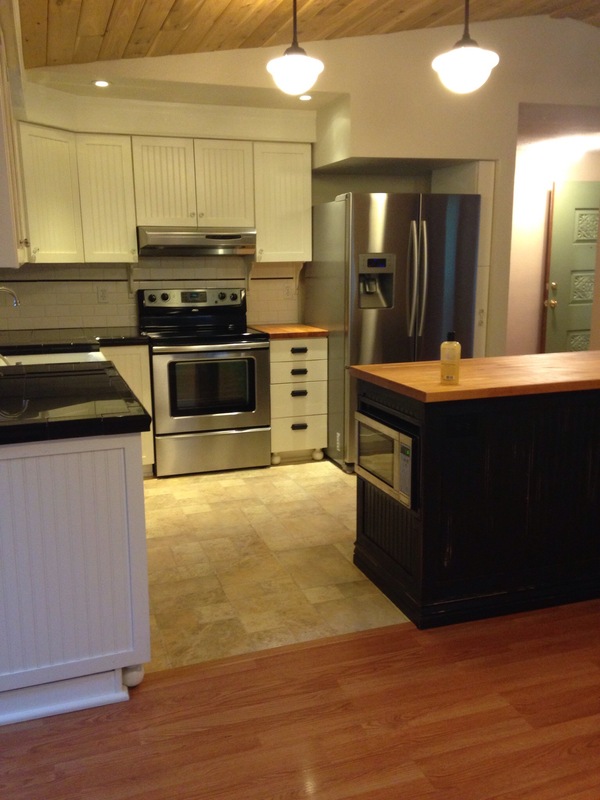 The view of the island with the microwave built in. 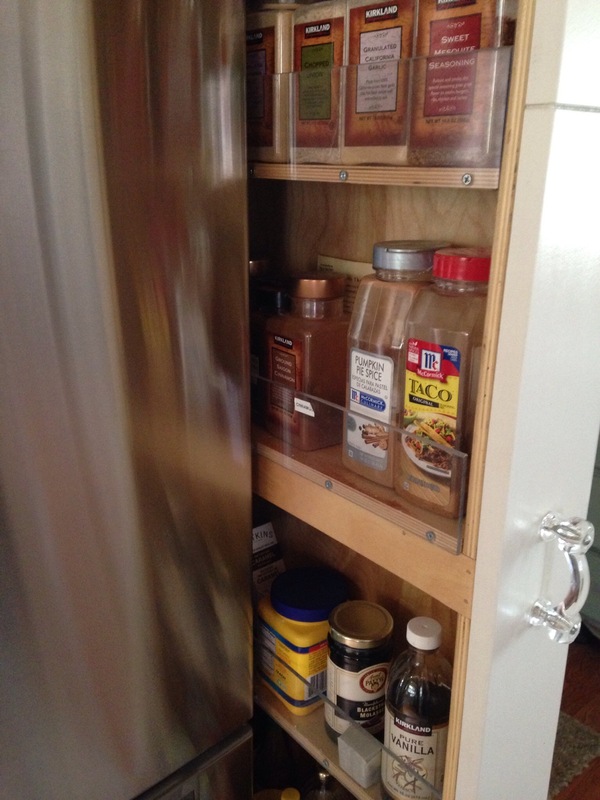 By the side of the refrigerator you can see the pull out spice cabinet. Love those schoolhouse lights! 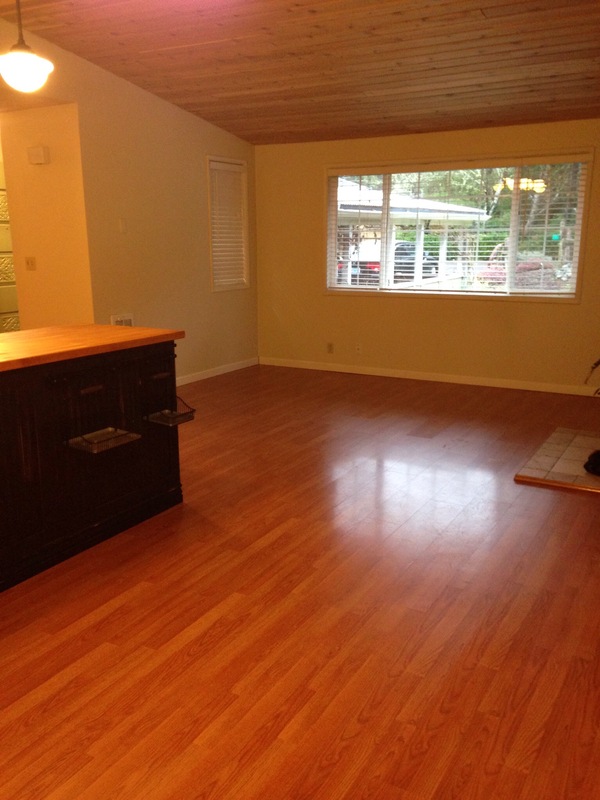 This photos shows the front room and the how the vaulted ceiling turned out when I installed the tongue and groove cedar. 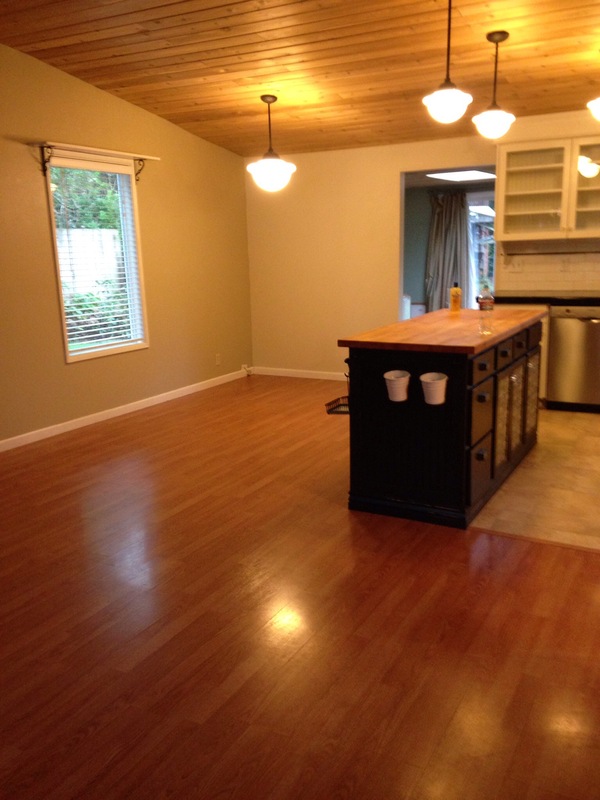 A sneak peek of the pantry office area, and out to the back yard. Of course the eating area. And a peek at the island end with those cute buckets. 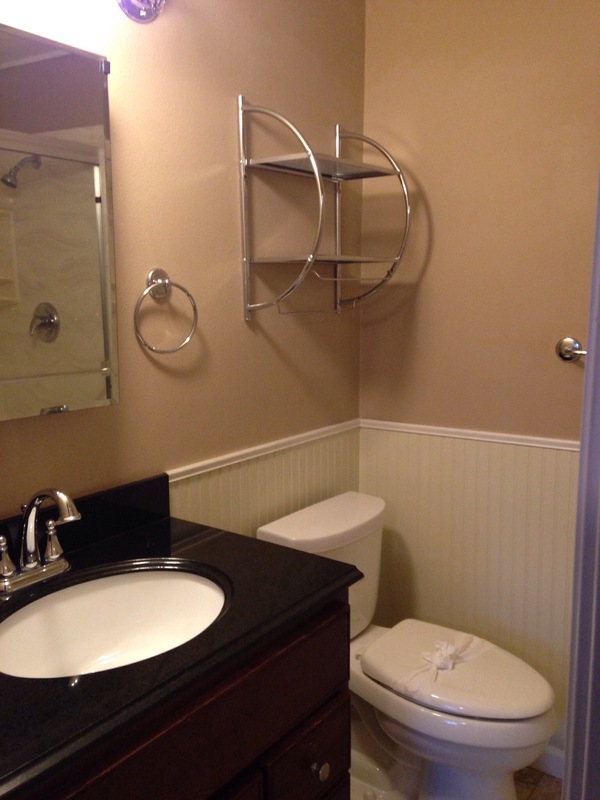 Here is a shot of part of the master bathroom. 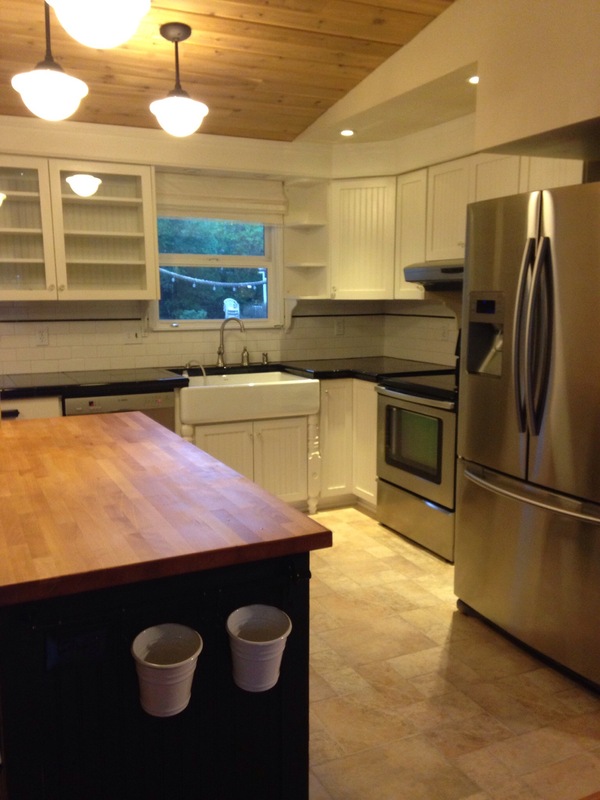 Love that granite counter and beadboard walls. A nice shot of that sink and view. The subway tile and bracket details. Another closeup of the details on this wall. The built-ins in the pantry. 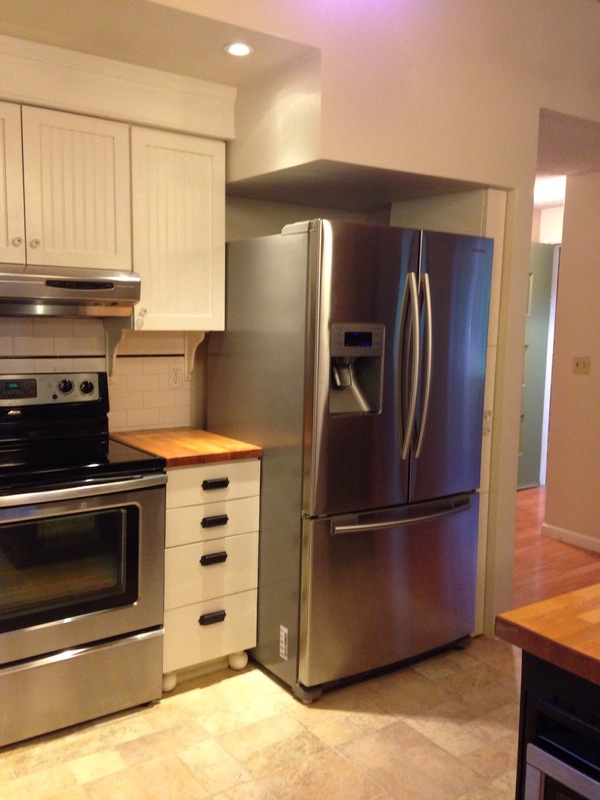 Notice the bar fridge faces out for easy access from the kitchen area. And a closeup of the pull out spice rack details. 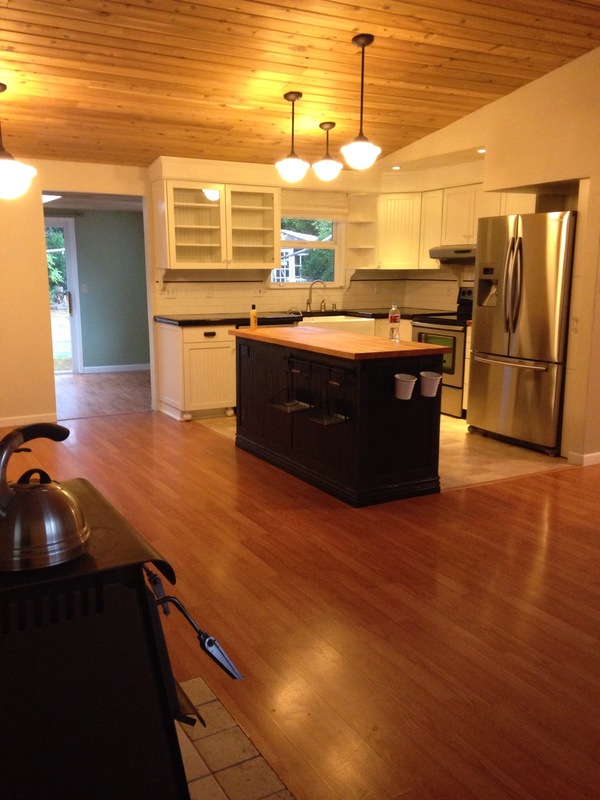 It was a once in a life time expirience to do this kitchen. I want to thank my cabinet man Frank Romaro from 541 Design for his talent and excellent understanding in what I was after. Also for letting me do all the tiling, floor, and building my custom island. 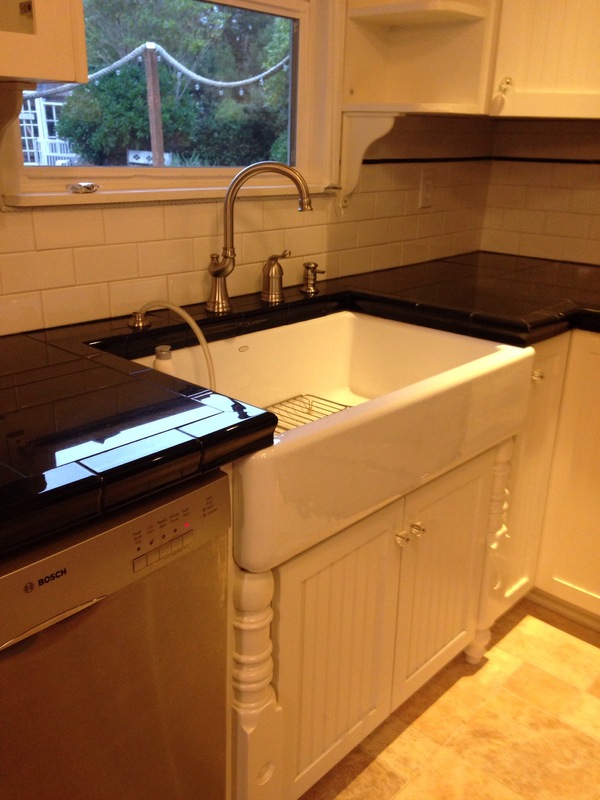 He went beyond in building the sink cabinet and making it all work. Well, it started out as redoing the guest room. 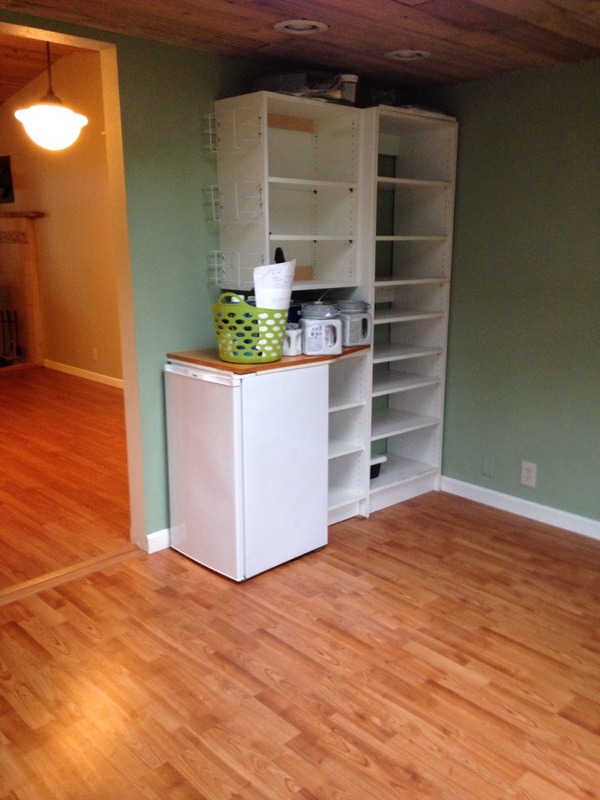 It became a dumping ground for all the mismatched furniture and belongings. I’m sure some of you know what I’m talking about. 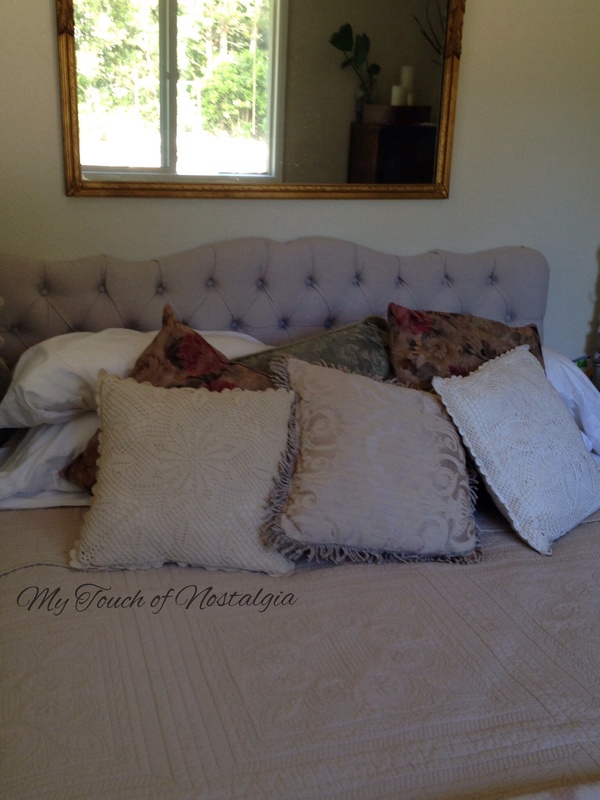 Some people choose to redo the guest room before the master bedroom. It wasn’t the case here. It ended up with any and everything that was replaced from other rooms. It was a “lovely” red velvet castoff from the 60’s? It came with the second husband. I always teased him about his Bordello headboard, as that is what I imagined when a bachelor has a Red Velvet tufted headboard! 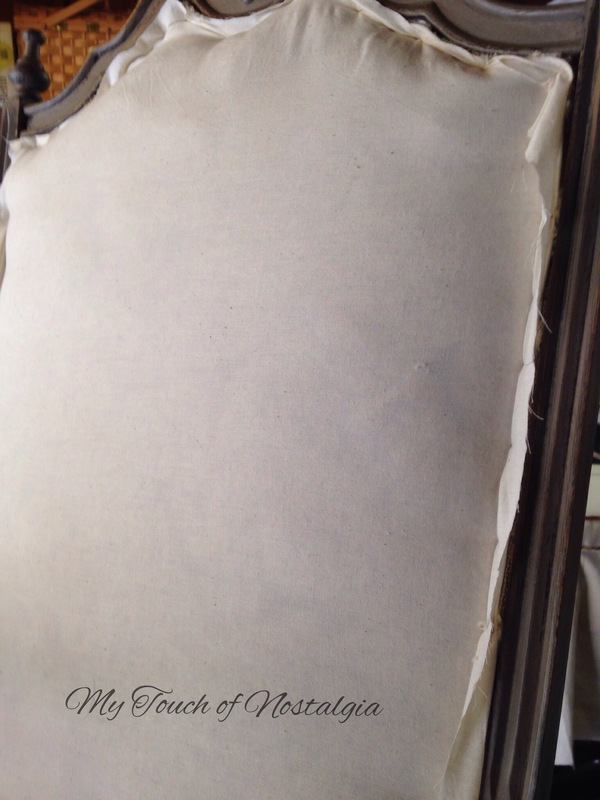 He tried to hide it with some animal hide, but it was lurking under there just the same! 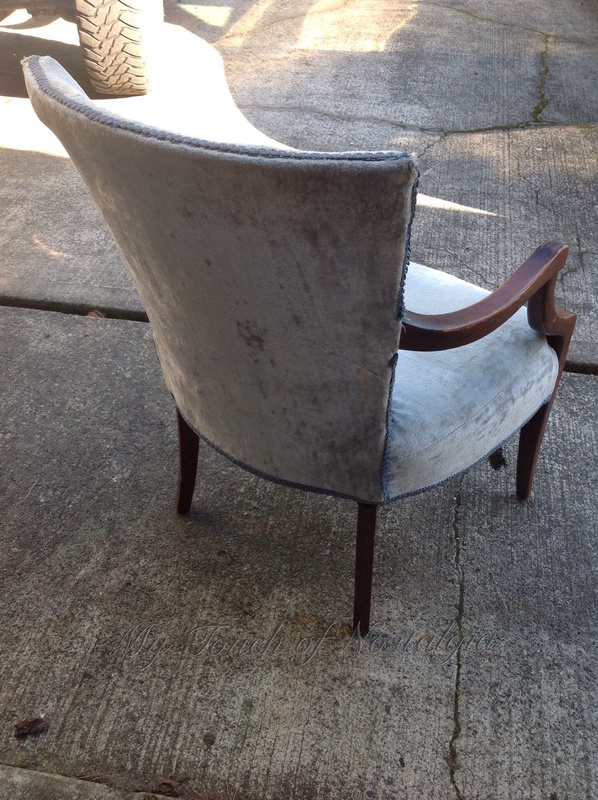 I didn’t get a good before photo (when I decided to reupholster I got it done!) it had also had a temporary makeover after we got married. In a striped fabric, then again when it was cast off into the guest room of our current house when I built our current headboard 10 years ago. So first I ripped the layers I added off. 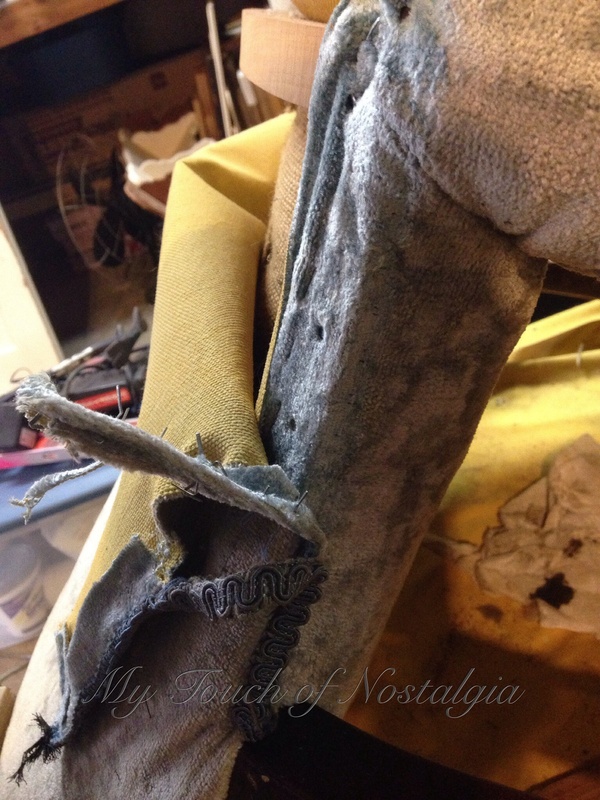 Be forwarned that when you decide to reupholster something it takes the longest to strip the old off and all those staples! So here she is all naked. I added longer legs so she shows when she is behind the bed. For some reason, I think maybe newer mattresses and box springs are thicker that they were back then? 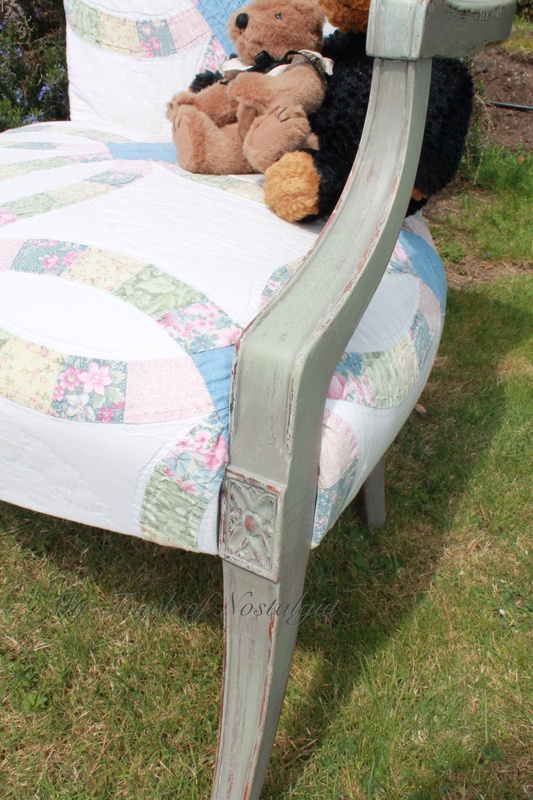 It seems that older headboards are short and don’t show up much. So I had to add more to the back and extra foam the same thickness as the original. I wanted to make her taller. It was in great shape so I was able to use it over again. As a side note the addition will be behind the mattress so really won’t show so no need to tuft or worry about the look of the new foam here. The foam already had the holes cut for the tufting. These are the size of a quarter, so they will have very deep tufting. 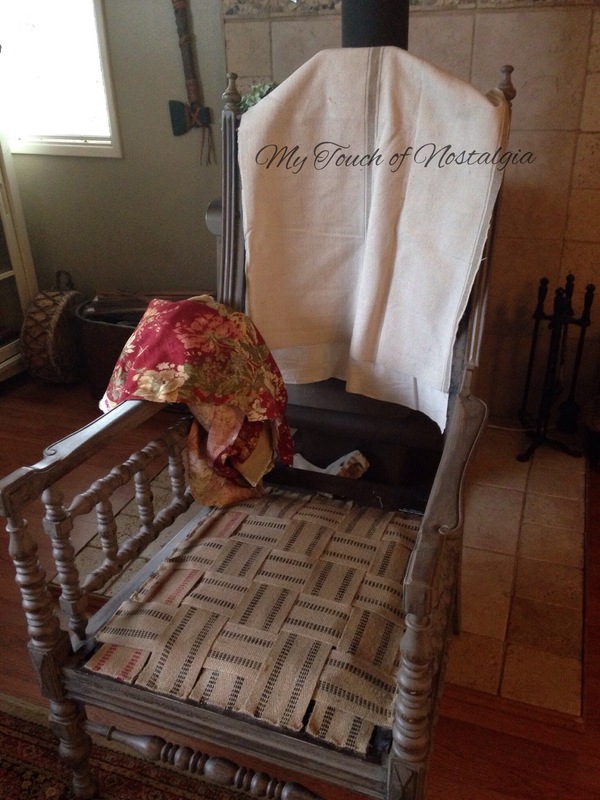 I chose a drop cloth and washed it several times with bleach and fabric softener drying it on High. 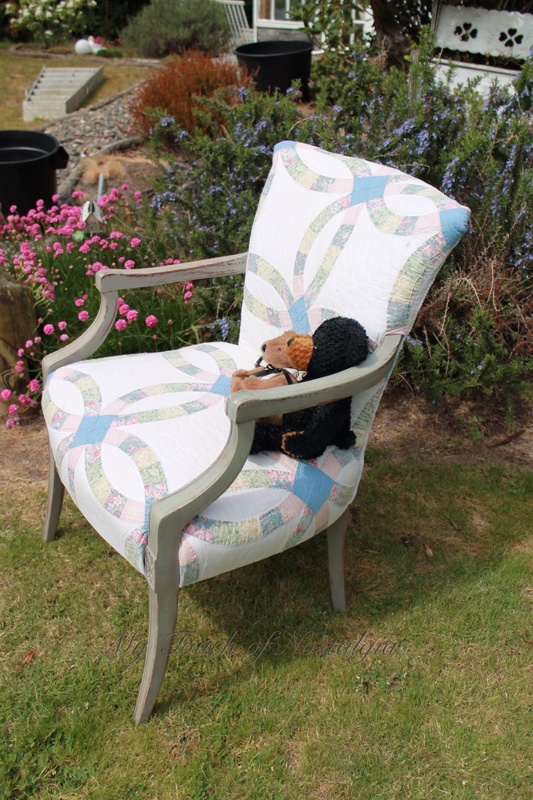 This made it a nice soft piece of large cheap fabric in a neutral tone. This made the perfect backdrop for the guest room makeover. I spread it out and placed the funky Red Velvet piece I removed on top and cut it out with a little extra around the edges for good measure. 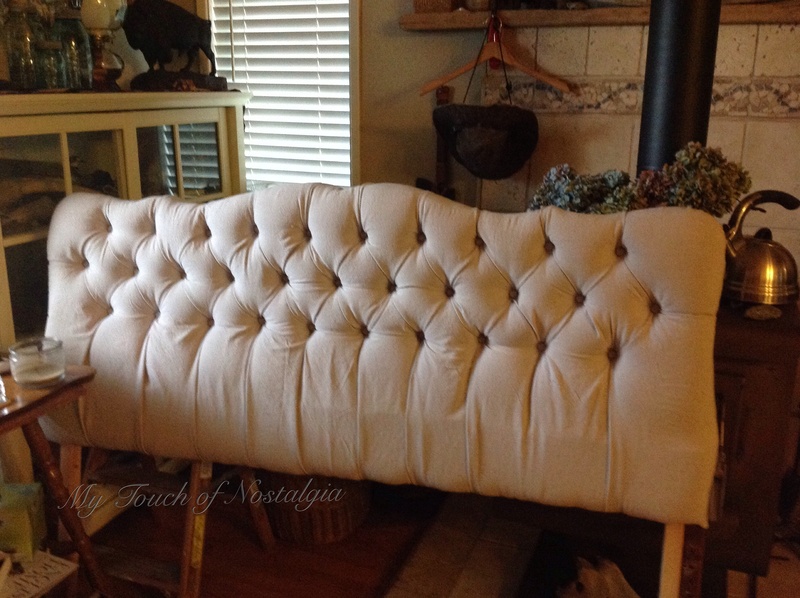 You will use extra fabric when tufting and it is better to trim later than discover you are short on one side after you have worked so hard placing the buttons and arranging the fabric. 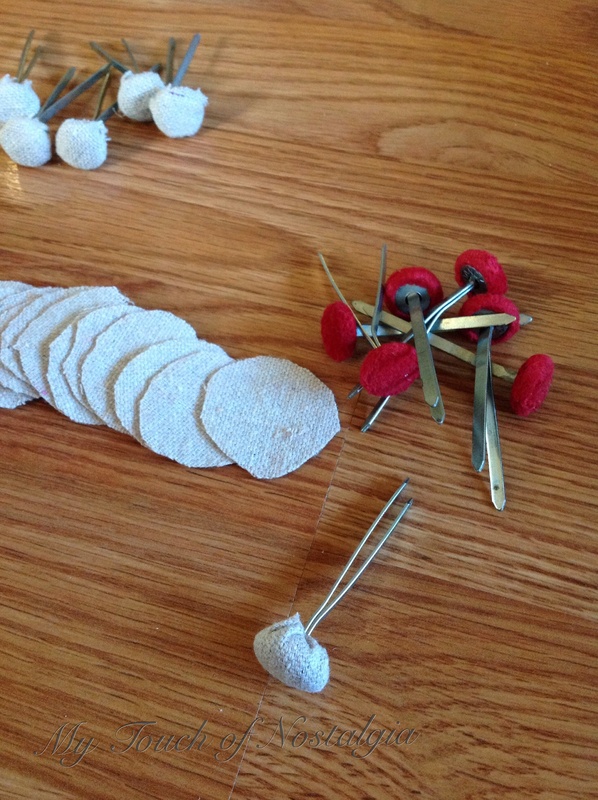 The buttons for the tufting were in great shape to reuse. I simply cut small circles from the new fabric. Then using the hot glue gun, attacked the new fabric to the buttons. 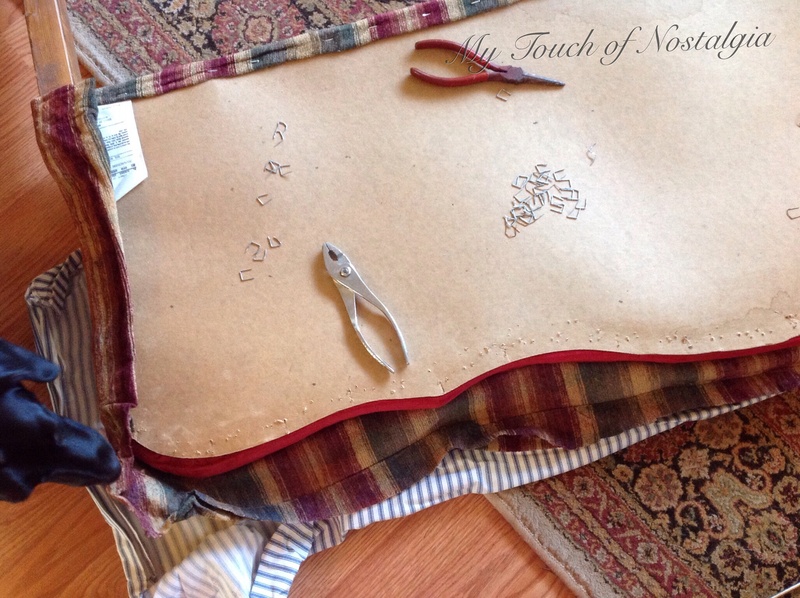 Apply a little hot glue to the button top and around the back then scrunch the fabric around. 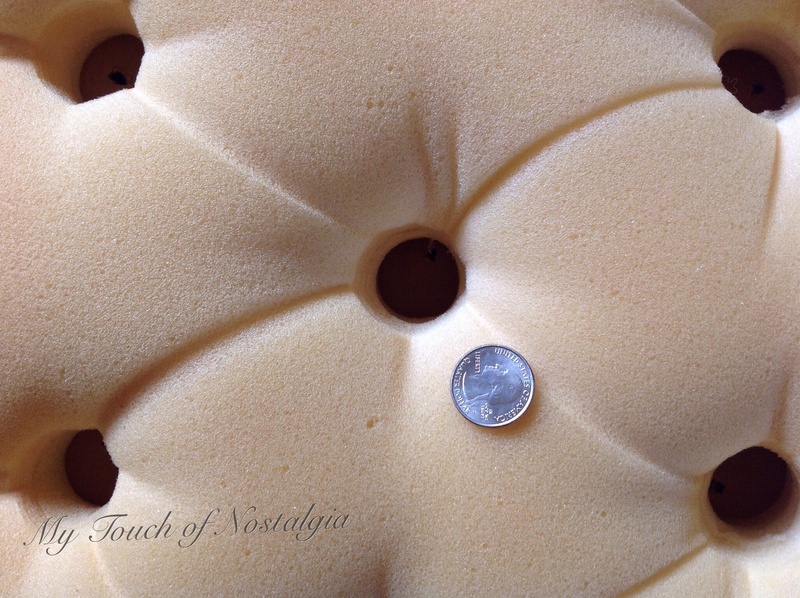 Once the buttons where all done, I spread the cut fabric onto the top of the headboard foam. Working from the center top I worked the points on the buttons through the fabric and back. It is important to start in the center and work down then from side to side. 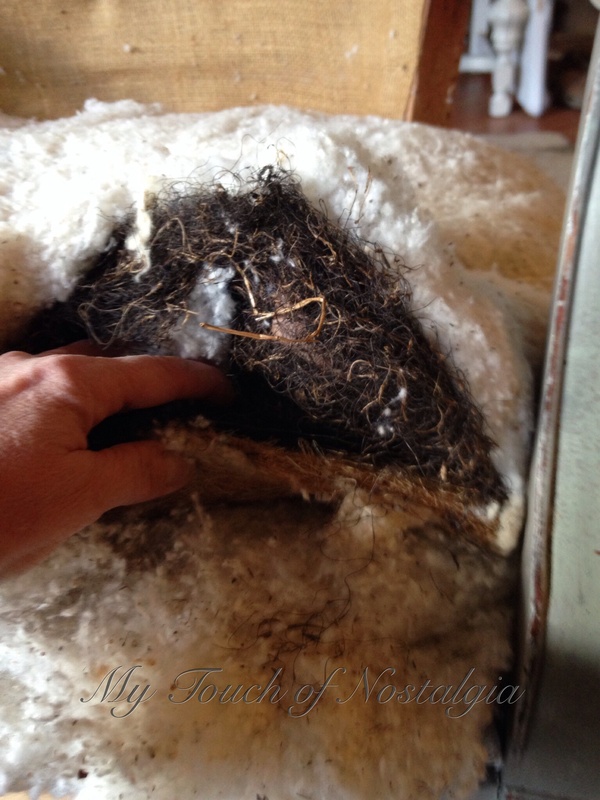 These are deep tufts and the fabric needed to be “folded” into the holes to create the deep tufts. Take your time here, you want this to look good. Once all the button tufts were in place it is time to staple around the edges. 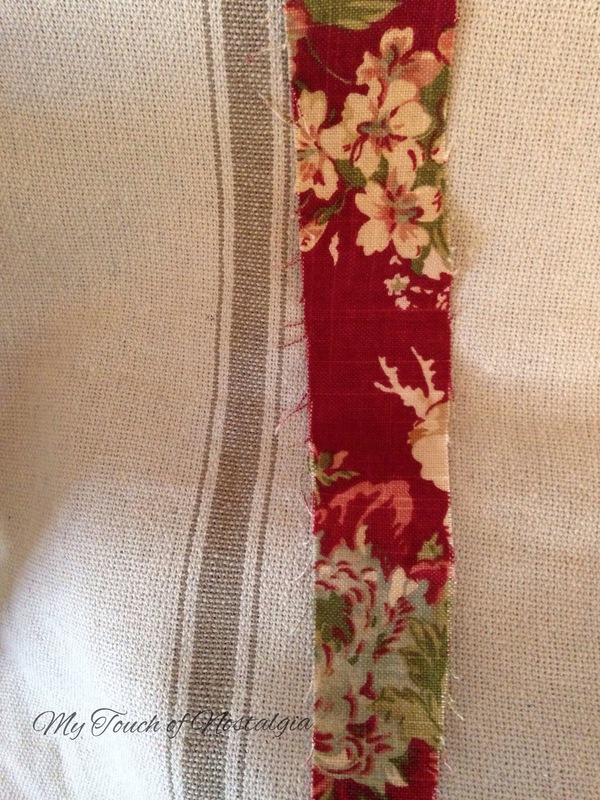 Here you will have to fold again that extra fabric from the tufts around to the back. Staple as you go. 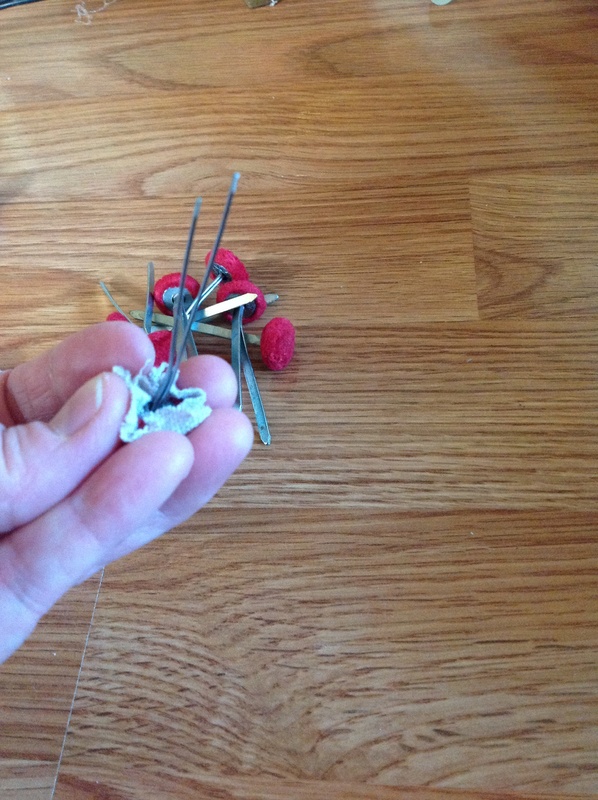 You can staple some backing material to the back or leave it open if you wish. If you want to save some money use and old sheet. Cut and fold under then staple around the back. Here it is. This awful photo is the only one I could find right after I finished stapling the back. You can see the new foam line but this is hidden behind the new mattress. It is a far cry from the “Bordello” headboard I started with. Now we have started with the guest room overhaul. I have been MIA for weeks now. 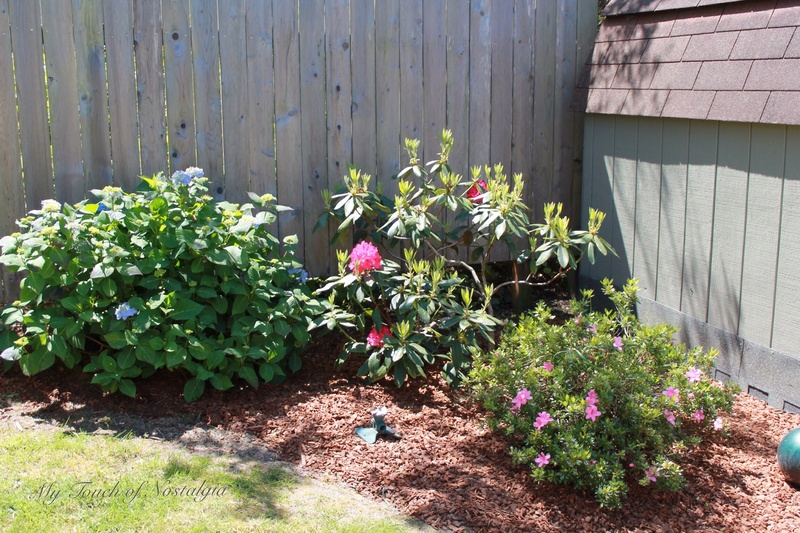 I have been a busy girl, between yard work on the nice days and finishing the interior of the house, working on furniture projects and tending to problems that have sprouted. Im sorry, but I promise you will be getting some great visuals real soon! Ok, so here is the back yard a couple of weeks ago! More things growing, plus a couple of lazy dogs sunbathing. My Queen Elizabeth roses bloomed out already. They are a very hardy rose. 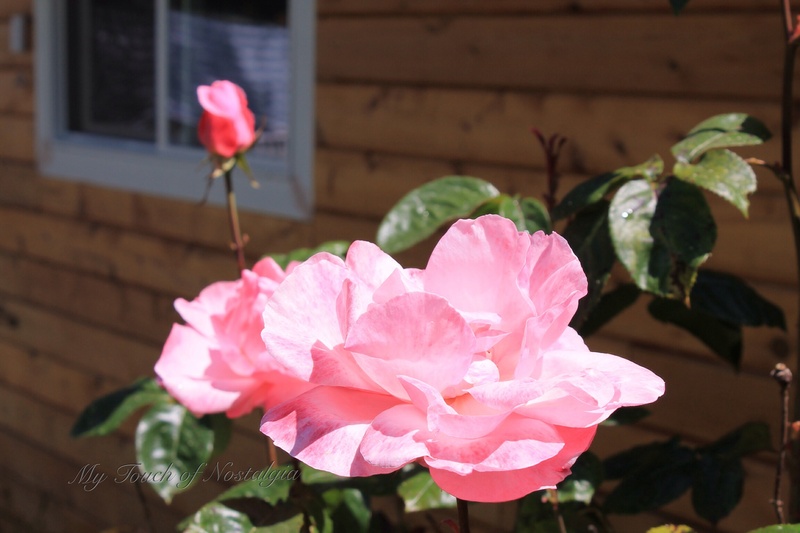 Most people cannot grow roses here, but these beauties are do just fine. 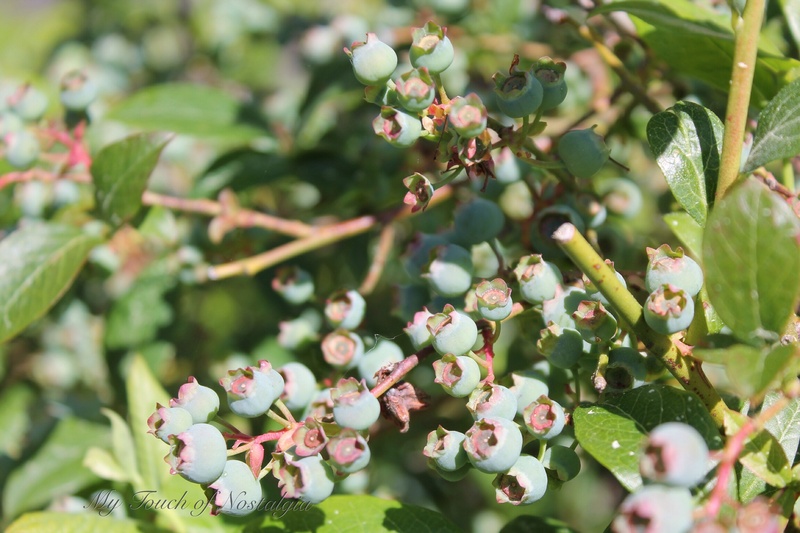 Bumper crop of blueberries this year! I guess I didn’t get any photos in this batch of all the wild Rhododendrons. 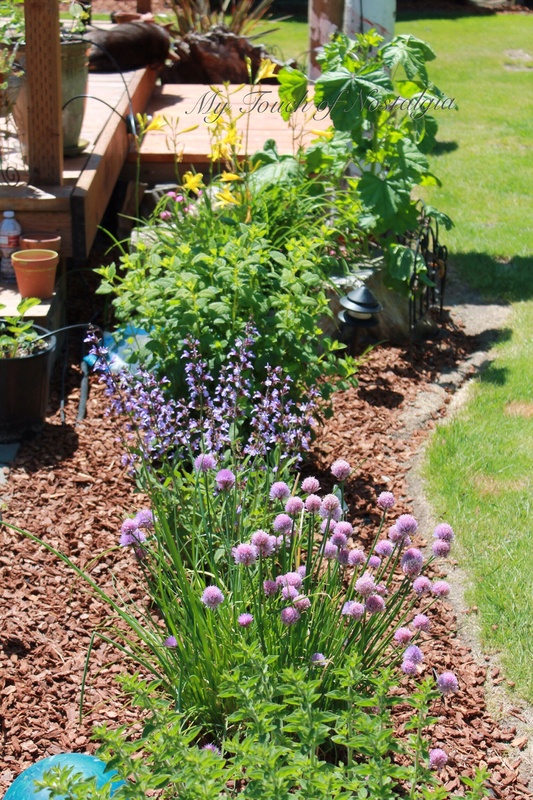 They border our back yard and we have 3 giant ones as part of the landscape. Stay tuned for round 2 of recycled part of the yard. 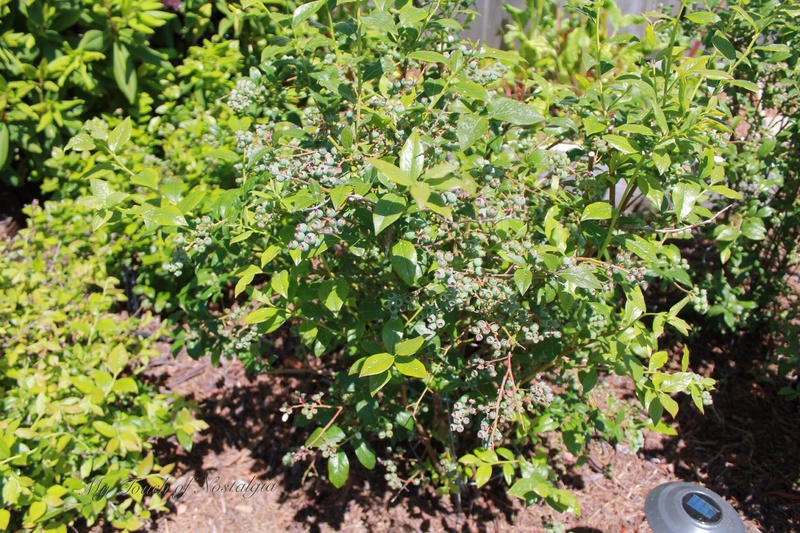 How is your blooms coming along? Sorry I’ve gone missing in action. With spring here the increased amount of work took over my life. I hope to have more fun stuff to share soon! 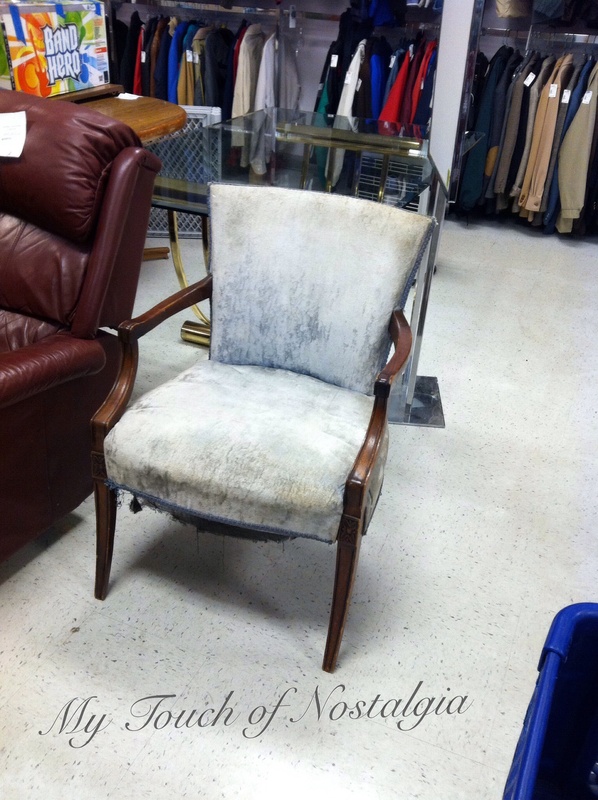 So I bought this stinky, ugly, dirty chair at Goodwill. I think the clerk thought I was crazy. I asked her to hold it for me while I shopped around some more. the look on her face was interesting to say the least. Can you see the dirt? It was nasty. It was also solid, and had gone bones. So, she came home with me. Needless to say she lived in the garage until I had time to devote to her! Then one day while on hold for a phone call for 1 hour 18 minutes, I started to rip her apart. I started with the trim, then disassembled her in the order she was put together. So off came the dust cover. Everything looks solid in the spring department. I also sanded the wood. It is that red Mohogany that is awful to paint strip and cover. Trying to to get it apart with ripping it up to bad. The structure is in good shape. The batting is pretty nasty, so it will need replaced. Here it is with the new cotton. 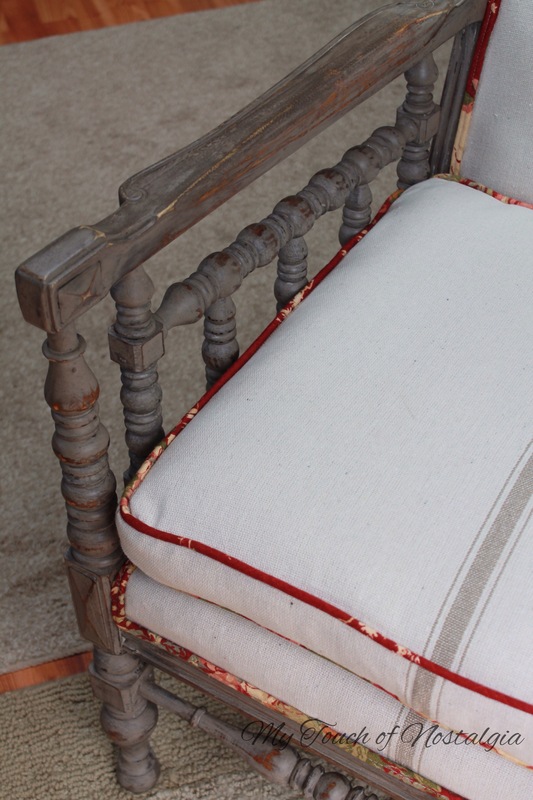 I reused the horsehair and woven seat insert. 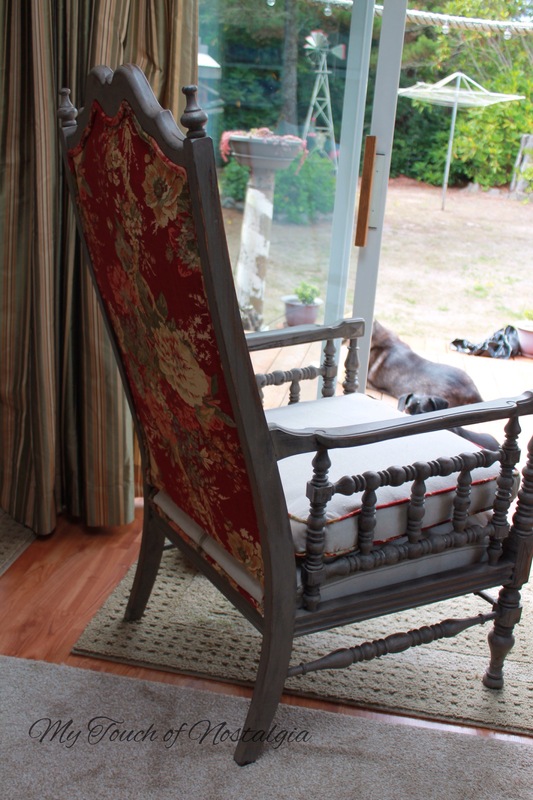 I sanded, painted with a primer to block the red, then painted with a mix of milk paint layered in colors. I got her all stripped, cleaned, and painted. The all new batting, and padding. 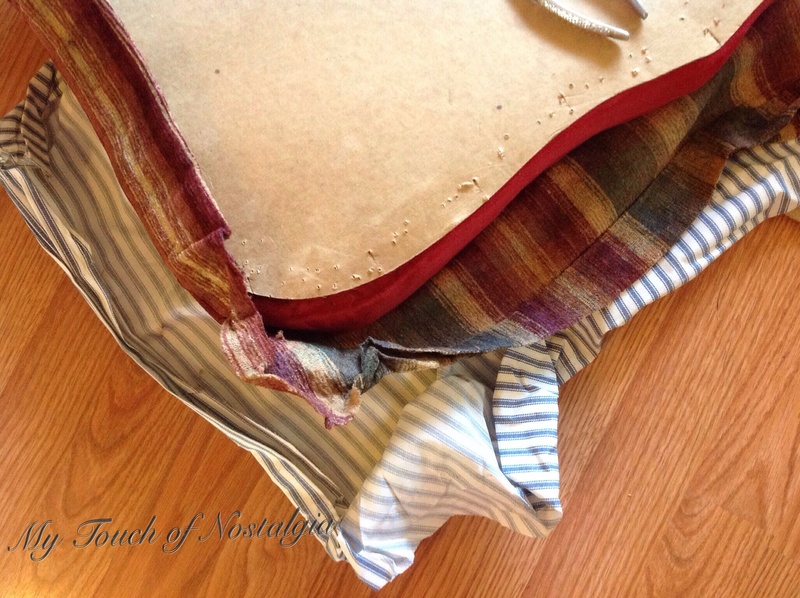 I had several things in my upholstery stash. 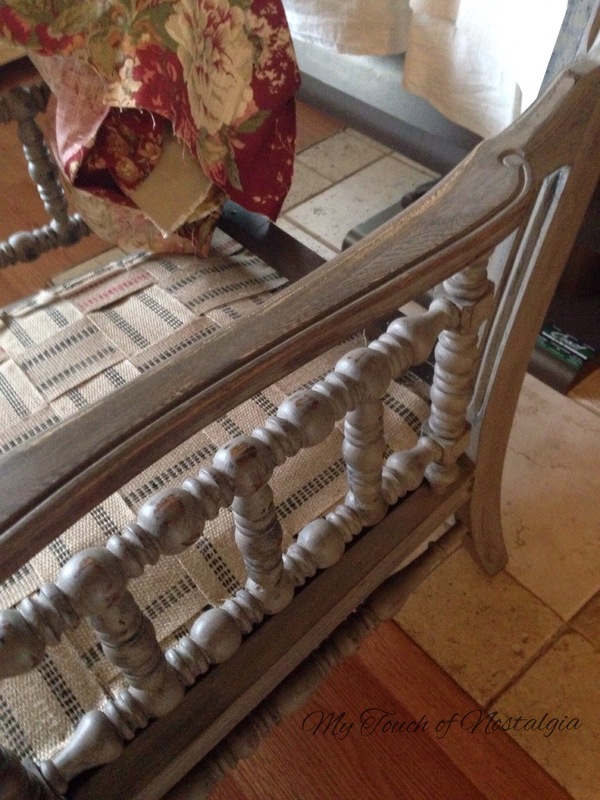 There was one piece that really seemed to work for this chair. 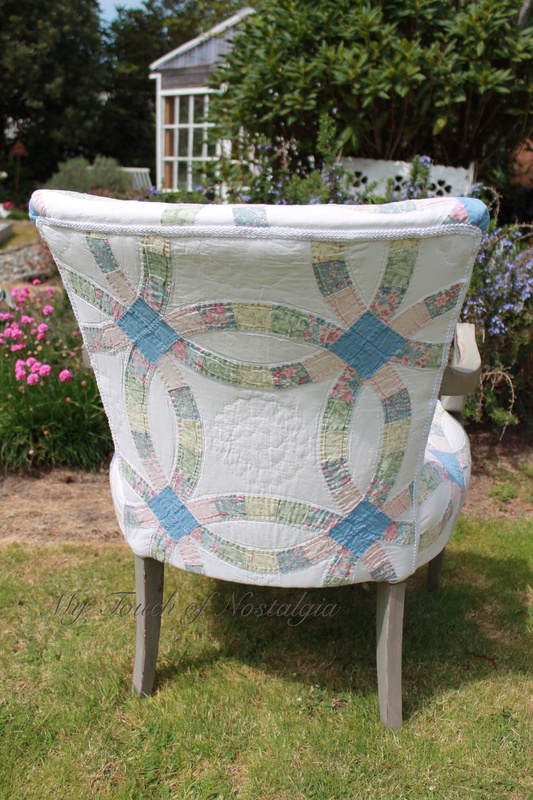 It was an older quilt the had a huge hole in it. Perfect. 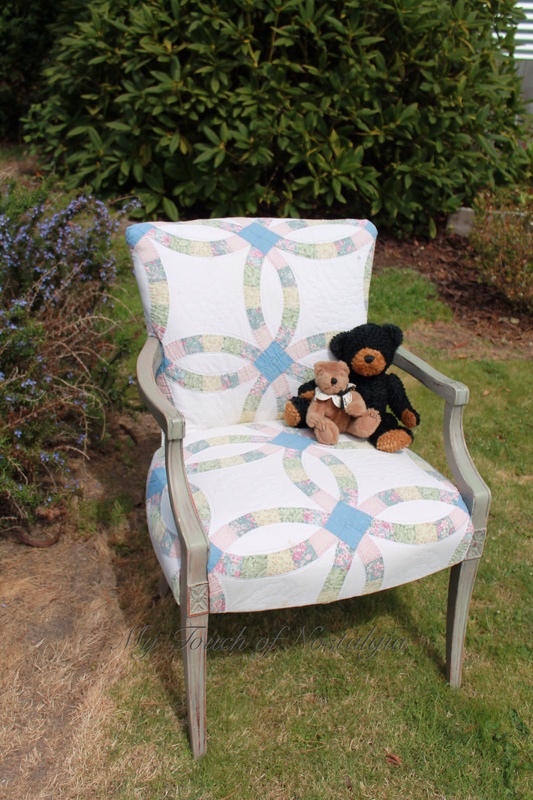 A “cutter” quilt. So I got started cutting out and matching up the pattern in the quilt, all the time working around a couple of holes. This shows just how dirty and nasty this chair was! 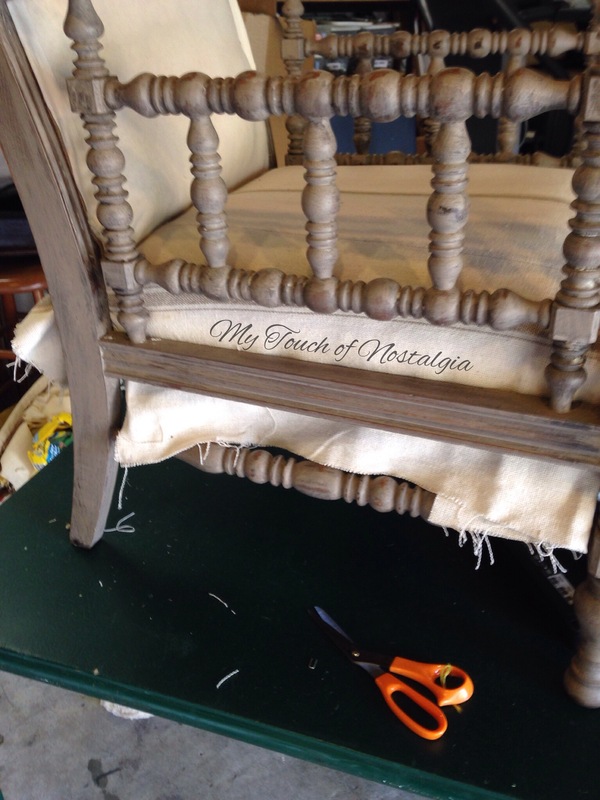 So after cutting then a covered the chair in it’s new clothes. She turned out pretty cute! Her backside is awesome too! She is for sale. And I will post where she will be located soon.